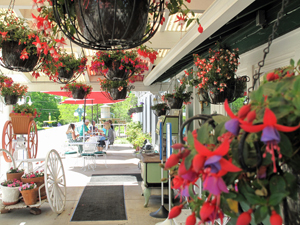 Open for Breakfast, lunch and dinner, May - October - this is Door County's Garden restaurant in North Ephraim. Nino and Armando (brothers) also own Fish Creek Grill - so expect great food here too! Surrounded by flowers and plants you will think you are in paradise. This place is famous for their homemade soups and fresh bread and their soup bar! Do it! You will love it! They have an early bird special from 7:30-9am that gives you some choices to combine eggs, pancakes, sausage, bacon, toast. Good stuff! 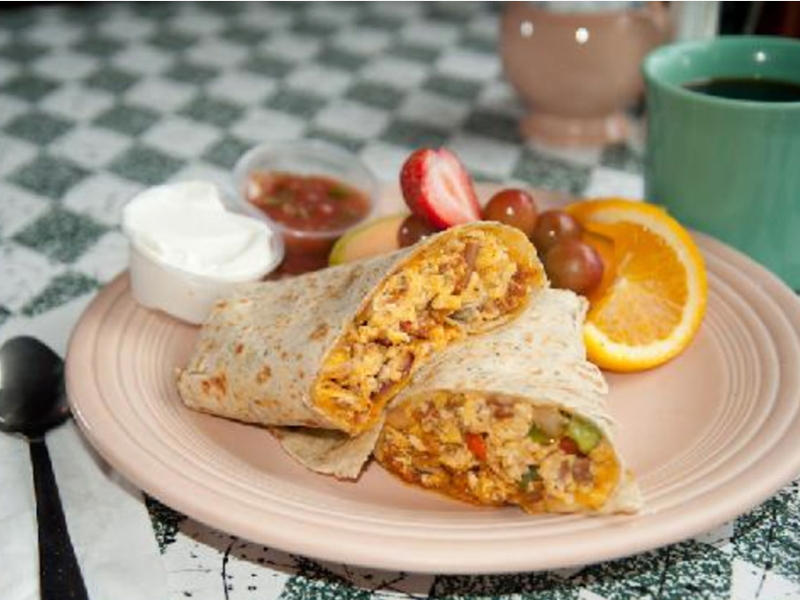 They also offer many things - something for everyone - from corned beef hash to a breakfast burrito, or breakfast sandwich, fruit plates, citrus French toast, a variety of omelets, quiche and more. You will find some delicious offering here for sure! All the sandwiches come with a cup of soup, crackers, fresh baked bread and fresh fruit. There is a "Taster's Cup" deal for $16.95 where you can go to the soup bar as many times as you like! Or yeah, we have done this. The homemade soups are terrific! (NOTE: they even have soup cook books for sale!). Or just opt for the Bowl or Two Cups choice, or just a single cup. Do the soup! It is great and you will thank DoorCountyNavigator.com! Come on in for dinner - all dinners include baked potato, side of veggies, fresh baked bread and soup or salad. Get the Door County Whitefish, or Lake Michigan Perch, or golden fried shrimp, or Lasagna, 1/2 chicken, or chop steak. Enough to choose from, or make the soup bar your dinner! Check out there menu here! 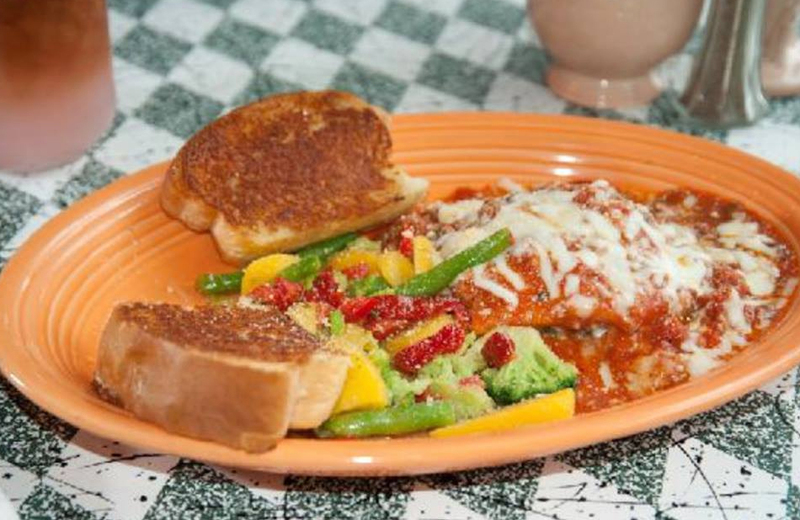 Summer Kitchen Restaurant in Ephraim sounds like the place you need to go - and it is. The folksy vibe and homemade soups are the perfect touch. They offer an extensive menu. Simple, yet a fiesta - and the fiesta-style dinner wear backs it up - a nice touch. Great soups at the soup bar and great food in a very fun and summery atmosphere. The outside is a garden, with a few tables on the deck for outdoor seating. There also is a ramp in addition to the steps to get into the restaurant - which one of the guests we were speaking with said is a terrific feature. They also serve beer and wine. We at DoorCountyNavigator like this restaurant a lot and highly recommend it. After we dined here a few times, we spent time with Armando, the owner along with his brother Nino (they also own Fish Creek Grill). We watched him prepare dishes in the kitchen, and got to understand his goal of customer satisfaction - his staff is friendly and efficient, and Armando is a real people-person in addition to a very good and creative chef. 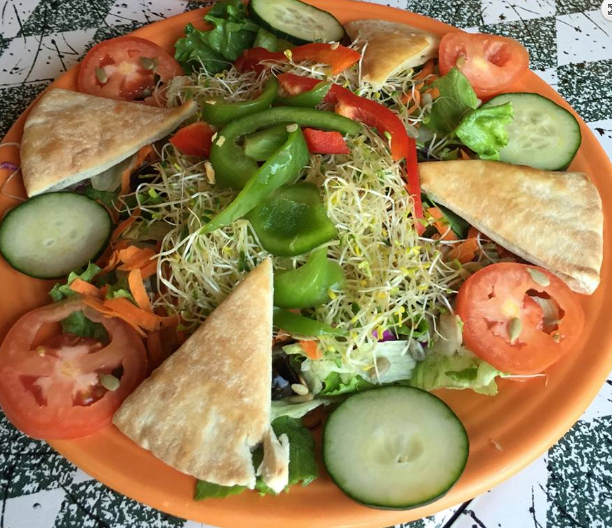 For lunch, one of our reviewers ordered the cashew chicken salad pita. 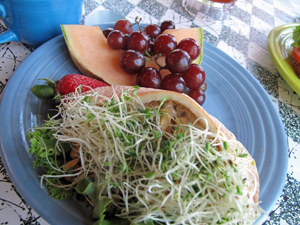 It was stuffed full with alfalfa sprouts and delicious cashew chicken salad. It came with a side slice of cantaloupe, strawberry and grapes. All dishes come with a cup of soup, or you can order the Taster's Cup, which includes as many trips to the soup bar you want to take - and you can sample all 5 soups available at any one time. I selected the chicken dumpling soup for me, and it was fabulous. Perfect flavor and texture and not over salted. Nice! 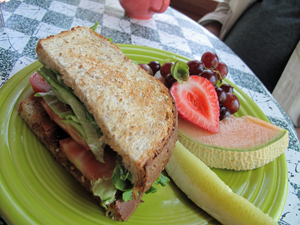 Our other reviewer ordered a BLT Special - this is one of our toughest reviewers. And he loved it. Crispy bacon was done perfectly and the sandwich was packed full, and was "excellent." Trust me, if this guy says it is excellent, it is excellent. Our reviewers are tough. He had the French Cabbage soup - terrific. We sampled the cherry bread pudding as well, and that was to die-for. Awesome. On another occasion, we ordered some breakfast items: eggs with hash browns - perfectly done; and French Toast. 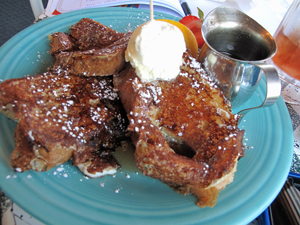 OK - look - do this if you like French Toast at all: ORDER THIS! It is thick, light cinnamon, and just stellar - this is a real winner. We also order fruit plate - and it was delicious. 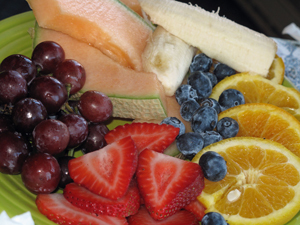 Fresh fruit just fills a large plate. Yum. 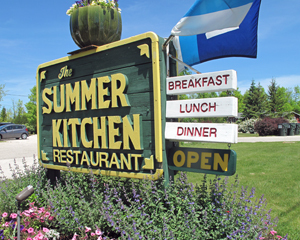 We highly recommend Summer Kitchen for the fun and the food. Mind-blowing soups, sandwiches and lots more. Open for breakfast, lunch and dinner. Head in and tell Armando that DoorCountyNavigator.com sent you - that helps us keep all this info flowing for you to have a better Door County vavcation! Enjoy! Other dishes we have tired in the past as well.